Upside Down at the Bottom of the World is an award-winning play that details D.H. Lawrence’s brief spell in Cornwall and Australia. It has particular resonance for David Faulkner as he played Lawrence in the original play at the beginning of his career and has now directed it in his retirement. D.H. Lawrence lived in Cornwall from 30 December 1915 to 15 October 1917 in what he hoped would be a new life away from the industrial Midlands of his birth. It didn’t quite work out as he planned. He was accused of being a spy, his passport was removed, and he was booted out of Cornwall under the Defence of the Realm Act. His short tenure on the edge of Britain would have a profound effect on his ideas, not least his developing fascination with cosmic vibrations and the mysterious secrets of primitive cultures emanating from the dark black granite Zennor coastline. Lawrence courted controversy throughout his short life, which is what I love most about him. He married a German woman called Frieda Weekley, a distant relation of the ‘Red Baron’, 15 days before the outbreak of WWI. The Rainbow, published the following year, lasted two months in print before being seized under the 1857 Obscene Publications Act. Prosecutor Herbert Musket declared it ‘a mass of obscenity of thought, idea, and action’ for daring to question fundamentals of everyday life, such as work, marriage and religion. Judge Sir John Dickinson ruled that the book ‘had no right to exist in the wind of war’, and that Lawrence was in effect mocking the very principles British men were fighting to defend. With no sense of irony, copies of The Rainbow were publicly burned, while ‘our’ boys fought for freedom on the Western Front. Lawrence would live a restless life, travelling the globe and staying no longer than two years in any one place. 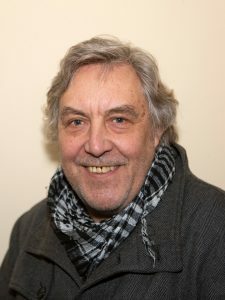 His experiences of living in Cornwall and Australia would serve as the backdrop to David Allen’s play Upside Down at the Bottom of the World. Originally performed in 1980, it scooped the Australian Writers’ Guild Award for Best Play. More recently, the play has been revived by David Faulkner and was performed at Lane Theatre, Newquay in March. It’s hoped the play may make its way back to Nottinghamshire at some point. Upside Down at the Bottom of the World was performed at Lane Theatre, Newquay, Cornwall, TR8 4PX from 14-16 March and 21 – 23 March 2019. This blog was originally published on the UNESCO City of Literature website. I’m currently working with Paul Fillingham on the D.H. Lawrence Memory Theatre. You can learn more about this digital pilgrimage by following the project blog or Instagram account. This entry was posted in City of Literature, Lawrence, UNESCO City of Literature and tagged D.H. Lawrence, David Faulkner by James. Bookmark the permalink.